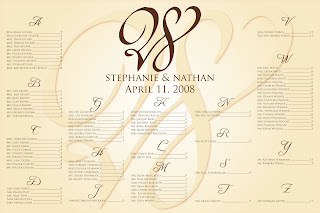 What’s the difference between seating cards and a seating chart? Does it matter? Are you serving a plated meal with various selections for your guests to choose from? If so, steer clear of the seating chart because you’ll need to distinguish their selections on the seating card for the servers or catering staff. A special ribbon color, paper color or other marking on the seating card is a simple way to show the guest’s dinner choice. Do you have limited seating, or the exact number of tables you’ll need for your guests? If so, you’ll need to consider some kind of table chart or seating cards because you’re guests will usually leave a seat or two open at their tables and that can’t happen if you are limited. Are you only reserving a few tables for your guests? While we don’t recommend this option, some brides and grooms don’t want to deal with seating details. If you have open seating, you want to make sure your parents and grandparents sit closest to you which means you will need to have a few reserved signs at those tables in advance. It is also important to reserve a table or two for your bridal party and their guests. There are other questions and circumstances for seating cards vs a seating chart but these are a few of the most important considerations.